Hyde signed a one-year deal with the Chiefs on Saturday, Adam Schefter of ESPN reports. The Jaguars are releasing Hyde on Friday, Tom Pelissero of NFL.com reports. Analysis: The Jags were hoping to find a trade partner, but they never had much chance unless Hyde agreed to a pay cut beforehand. The 27-year-old running back will be an unrestricted free agent, coming off a 2018 campaign in which he produced a career-low 3.3 yards per carry across six games for the Browns and eight for the Jaguars. Most of the teams interested in Hyde figure to view him as a committee back or even an outright backup. The Jaguars are actively looking to trade Hyde, Adam Schefter of ESPN reports. 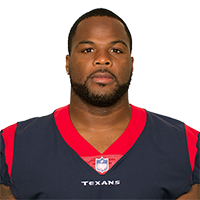 Hyde rushed for 13 yards on 10 carries and caught two passes for six total yards during Sunday's 20-3 loss to Houston. Hyde (knee) is listed as active and starting Sunday's game against the Texans, John Oehser of the Jaguars' official site reports. Analysis: With Leonard Fournette (foot/ankle) inactive, Hyde will draw the start Sunday, but he figures to share work in some fashion with T.J. Yeldon and David Williams, a potential time-share arrangement that makes all three players Week 17 fantasy darts. Hyde (knee), who is listed as questionable for Sunday's game against the Texans, is expected to play, Adam Schefter of ESPN reports. Analysis: With Leonard Fournette (foot/ankle) listed as doubtful, Hyde's ability to suit up would take on more importance than usual. If available, Hyde would likely split work in some fashion with T.J. Yeldon and Dave Williams, rendering him little more than a dart throw for fantasy purposes. Hyde (knee) is listed as questionable for Sunday's game against the Texans, Daniel Popper of The Athletic reports. Analysis: With Leonard Fournette (ankle/foot) listed as doubtful and the Jaguars at 5-10, we doubt the team will push Hyde to play this weekend if his knee is less than 100 percent as game time approaches. If both Hyde and Fournette sit Sunday, the team's Week 17 backfield would be headed by T.J. Yeldon and David Williams. Hyde was seen riding an exercise bike at Friday's practice after going through several minutes of drills, John Reid of The Florida Times-Union reports. Analysis: Hyde has not been listed on the injury report this week, so it's not clear if he suffered some type of setback at Friday's practice, or if he is simply taking it easy at the Jaguars' last official session of the season. Expect his status to be updated further when the Jaguars release their final injury report of the week. Hyde rushed for 47 yards on eight carries during Sunday's 17-7 win over Miami. Hyde (coach's decision) is inactive for Sunday's game against Washington. Analysis: With Hyde not in the mix Sunday, T.J .Yeldon will work behind starter Leonard Fournette, with Dave Williams on hand as a reserve option. Hyde caught his lone target for minus-3 yards in Thursday's 30-9 loss to the Titans. Hyde rushed 13 times for 36 yards, caught his lone target for one yard and lost a fumble in Sunday's 6-0 win over the Colts. Analysis: It wasn't a pretty afternoon for either offense, as neither team was able to find the end zone. Hyde split work with T.J. Yeldon (eight carries, seven receptions) while Leonard Fournette was serving a one-game suspension. 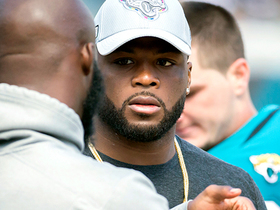 Fournette will return to lead back duties against the Titans in Week 14, leaving Hyde in more of a supporting role. Hyde is expected to see a heavier workload Sunday against the Colts after fellow running back Leonard Fournette was handed a one-game suspension, Adam Schefter of ESPN reports. Hyde ran for 33 yards on 10 carries during Sunday's 24-21 loss to the Bills. Analysis: Five of Hyde's carries came after Leonard Fournette was ejected in the third quarter. Hyde was acquired from Cleveland with the thought that he'd serve as a solid fallback to Fournette, but he's averaged just 3.4 yards per carry in his four games with the Jags. Next Sunday should provide another tough test against a Colts defense ranked in the top 10 in the league against the run, surrendering just 3.9 yards per rush. Hyde rushed eight times for 44 yards and wasn't targeted in the passing game in Sunday's 20-16 loss to Pittsburgh. Analysis: Hyde and T.J. Yeldon (seven touches) split the leftovers behind Leonard Fournette (30 touches). Jacksonville led 16-0 in this one and went about as run-heavy as possible, so it was discouraging to see Hyde fail to make much happen despite favorable game flow. He's a great insurance option, but Hyde's touches likely will remain limited as long as Fournette remains healthy. Don't bank on much from Hyde against the Bills in Week 12. Hyde had three carries for five yards in Sunday's 29-26 loss to the Colts. Hyde rushed six times for 11 yards and failed to haul in either of his two targets in Sunday's 24-18 loss to the Eagles in London. Analysis: Hyde's Jaguars debut was a major disappointment, though he did get six carries to T.J. Yeldon's two. Game flow forced Jacksonville to abandon the run as the team trailed for the entire second half, so Yeldon was able to flash his pass-catching chops with seven receptions while Hyde's impact was limited. The trade acquisition from Cleveland will have an opportunity to further familiarize himself with his new team's playbook during the Week 9 bye. Hyde, who nearly played in Sunday's 20-7 loss to Houston, believes he'll be a perfect fit in the Jacksonville offense, John Oehser of the Jaguars' official website reports. Hyde is inactive for Sunday's game against the Texans. Analysis: Hyde was just acquired by the Jaguars on Friday, so he'll sit this one out. The veteran back will look to gain added familiarity with the team's playbook in the coming days, with an eye toward working in tandem with T.J. Yeldon in Week 8, assuming Leonard Fournette (hamstring) sits out next weekend's game against the Eagles as expected. Hyde, who was acquired from the Browns on Friday, could make his Jaguars debut Sunday against the Texans, though he would likely only take the field for a small package of plays in such a scenario, James Palmer of NFL Network reports. Hyde isn't expected to unseat T.J. Yeldon for the lead role out of the Jacksonville backfield in Sunday's game against Houston, Michael DiRocco of ESPN.com reports. The Browns shipped Hyde to the Jaguars on Friday in exchange for a future fifth-round draft pick, Tom Pelissero of NFL.com reports. The Browns agreed to trade Hyde to the Jaguars on Friday, Adam Schefter of ESPN reports. Hyde rushed 14 times for 34 yards during Sunday's 38-14 loss to the Chargers. 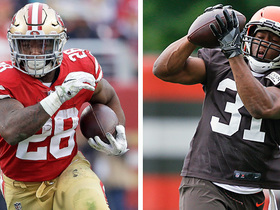 Analysis: While once again it was Hyde handling the bulk of Cleveland's carries, the Browns' other two running backs -- Duke Johnson and Nick Chubb -- outperformed him with far fewer opportunities. Johnson and Chubb racked up 51 yards on the ground on just five totes, as Hyde has now averaged under three yards per rush on three occasions. 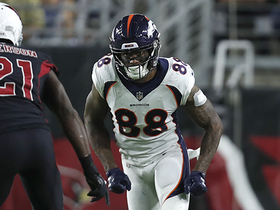 The 28-year-old back also failed to score a touchdown for the second consecutive game after crossing the goal line five times in the team's first four weeks. Hyde rushed 17 times for 63 yards and caught two of three targets for 14 yards during Sunday's 12-9 overtime victory over the Ravens. Analysis: For the first time in 2018, Hyde failed to find the end zone, stopping his streak of six consecutive games with a touchdown going back to last year. The 28-year-old running back is only averaging 3.4 yards per carry and has yet to reach the century mark in a game, but he's the clear-cut No. 1 back in Cleveland and his volume and red-zone usage make him a valuable fantasy commodity. Hyde will look to start a new touchdown streak in Week 6 against the Chargers. Hyde carried 22 times for 82 yards and a touchdown during Sunday's 45-42 overtime loss to the Raiders. Hyde rushed 23 times for 98 yards and two touchdowns and secured two of three targets for five yards in the Browns' 21-17 win over the Jets on Thursday. Hyde is listed as active and is present for Thursday's game against the Jets, Dianna Russini of ESPN reports. Analysis: NFL Network's Omar Ruiz previously reported that the running back had been expecting the birth of his child, but subsequently relayed that Hyde headed straight to the stadium from the hospital and arrived in advance of Thursday's kickoff. Hyde rushed 16 times for 43 yards and a touchdown during Sunday's 21-18 loss to the Saints. He also caught his only target for seven yards. Analysis: Hyde was once again the bell-cow back Sunday, as rookie Nick Chubb and Duke Johnson accounted for just five carries combined. Though Hyde has yet to put up even average yards-per-carry numbers, the fact he's seeing essentially all the touches out of the backfield and has scored in the first two games of the season has made him valuable in almost all fantasy formats. 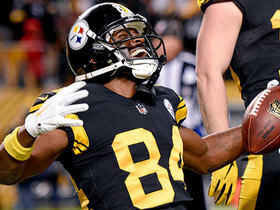 Hyde rushed 22 times for 62 yards and a touchdown during Sunday's 21-21 tie with the Steelers. He also caught one of his two targets for three yards. Analysis: The Browns used Hyde as its bell-cow running back to begin the season, with backups Duke Johnson and rookie Nick Chubb combining for a total of eight carries. Though Hyde's 2.8 YPC figure doesn't stand out in a positive way, the fact he saw the bulk of the work is certainly encouraging for fantasy owners. We'll see if that trend continues next week when the Browns face the Saints. Hyde ran for 45 yards on seven carries and lost five yards on a reception during Thursday's 5-0 win over the Eagles. Hyde (shoulder) is practicing Monday, Nate Ulrich of the Akron Beacon Journal reports. Hyde left Sunday's practice early with an apparent shoulder injury, Scott Petrak of The Chronicle-Telegram reports. Analysis: Hyde's shoulder injury isn't believed to be anything serious, but it will be something to keep an eye on heading into the Browns' third preseason tilt against the Eagles on Thursday. If Hyde is forced to miss additional practice time throughout the week, Duke Johnson and rookie Nick Chubb would be in line for increased roles with the first-team offense. Hyde took nine carries for 64 yards and a touchdown and lost five yards on one reception in Friday's preseason loss to the Bills. 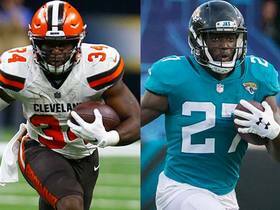 Analysis: Hyde and Duke Johnson split snaps with the first-team offense, only giving way to Nick Chubb after Baker Mayfield replaced Tyrod Taylor at quarterback. Chubb finished with 53 yards and a touchdown on 11 carries, but his usage supports the general expectation that he'll start the season behind the pair of veterans. Hyde still carries limited upside, as Johnson is locked in on passing downs and Chubb has more than enough talent to push for a significant role. The Browns drafted Nick Chubb at No. 35 overall to join Hyde and Duke Johnson in the backfield, Bud Shaw of The Cleveland Plain Dealer reports. Hyde said that Saquon Barkley would be a good addition to the Browns, Nate Ulrich of The Akron Beacon-Journal reports. "Saquon would be a nice addition to the team, another guy who can out and make big plays," Hyde said. "Use all the weapons you can. If he comes here, the more the better, so he'd definitely be a great addition." Hyde is expected to sign Wednesday with the Browns on a three-year, $15 million contract, Ian Rapoport of NFL Network reports. Hyde is in contract discussions with the 49ers, but general manager John Lynch said nothing is imminent, Cam Inman of The San Jose Mercury News reports. Hyde toted the rock 15 times for 90 yards and a pair of touchdowns in a 34-13 win over the Rams on Sunday. He added two catches (four targets) for 10 receiving yards. Hyde ran for 54 yards and one touchdown on 21 carries against Jacksonville on Sunday, adding three receptions for 19 yards. Analysis: Backup Matt Breida was more explosive than Hyde, totaling 74 yards and a touchdown on just 11 carries, but Hyde's 21 carries are a reassuring indication that Breida is still viewed as a complementary runner behind Hyde's workhorse role. Hyde gets a shot next week at a Rams defense that's generally been vulnerable on the ground this year, and his offense as a whole is constantly looking brighter under the direction of Jimmy Garoppolo. Hyde carried 16 times for 25 yards and caught both his targets for an additional 14 yards during Sunday's 25-23 win over the Titans. Hyde rushed 14 times for 78 yards and a touchdown while failing to haul in his lone target in Sunday's 26-16 win over Houston. Analysis: The highlight of Hyde's afternoon was his first touchdown since Week 6. He was originally bottled up down the middle on that play, but bounced it outside for a two-yard score to make it 10-3 just before the two-minute warning in the first half. San Francisco has won consecutive road games with Jimmy Garoppolo under center, so Hyde's workload should remain lofty at home next week against the Titans. Hyde rushed 17 times for 54 yards and added 12 more while catching three of five pass attempts in Sunday's 15-14 victory over the Bears. Hyde rushed for 47 yards on 16 carries and added 21 yards on seven catches during Sunday's 24-13 loss to Seattle. Hyde gained 98 yards on 17 carries and caught two passes for an additional six yards during Sunday's 31-21 win over the Giants. Hyde was ejected from Sunday's game against the Cardinals, Matt Barrows of The Sacramento Bee reports. The "NFL Total Access" crew discuss which of the more intriguing position battles from around the NFL will be their favorites to watch heading into training camp. NFL Media's Senior Fantasy Analyst Michael Fabiano assesses the fantasy value for stars with new teams. 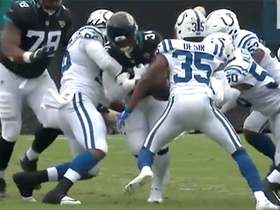 Indianapolis Colts DE Denico Autry punches out ball to cause Jacksonville Jaguars running back Carlos Hyde to fumble. 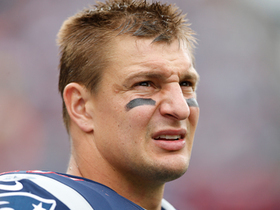 Get all the latest NFL news and how the news impacts your fantasy team. NBC Sports Soccer commentator Arlo White talks about the expectations for the Jaguars on Sunday against the Eagles. 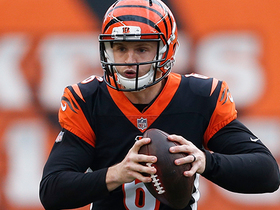 The "NFL Fantasy Live" crew discuss players you should avoid starting in Week 8. 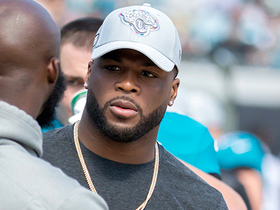 NFL Network's MJ Acosta gives an update on the status of Jacksonville Jaguars running backs Leonard Fournette and Carlos Hyde for Week 8 against the Philadelphia Eagles. NFL Network Insider Ian Rapoport has the latest on if running back Carlos Hyde will play vs. the Houston Texans in Week 7 of the 2018 NFL season. The "NFL Fantasy Live" crew discuss the fantasy implications of running back Carlos Hyde being traded to the Jacksonville Jaguars. The "NFL Fantasy Live" crew gives you players to trade for and players you should trade away on your fantasy team.